Thank you for supporting the L-Tron Cuddle Bear Drive. It was a great success thanks to the contributions and support of our friends and community. It was our honor to help support Mayor Lovely A. Warren’s Books and Bears Program, the children in our community and the Rochester NY Police Department. Giving back is a big part of the L-Tron culture. Thank you for supporting the L-Tron Cuddle Bear Drive. 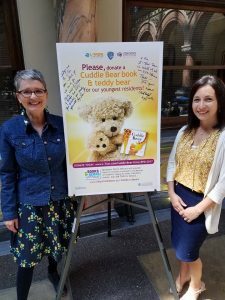 The Books and Bears Program is close to our hearts because it benefits children at a time of need; as a company we work closely with Law Enforcement agencies nationwide and love to show our support for causes that “back the blue” in the local community. Our marketing team members delivered over 500 man hours. Our Happy Hour event – sponsored by Papaya Restaurant – was attended by over 40 people. We received support & news coverage from several local TV stations. We received support & news coverage from several local newspapers. We had a total of 26 financial supporters (both individuals and companies). We together raised $3,480.00 resulting in 136 Usbourne Cuddle Bears and 133 Cuddle Bear Books. We increased community awareness of the Books and Bears Program.